Which State in the Lower 48 Has the Highest Gas Prices? 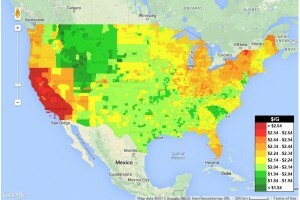 Which State in the lower 48 has the highest gas prices? You probably already know the answer. But today’s gas price map on GasBuddy.com is too pretty not to share with visitors to this blog. The long-reigning, undisputed champion of pain at the pump is (drum roll . . .) the State with the most ‘progressive’ energy and climate policies. California is to America what Robins are to Canadians, harbingers of change, in this case the growth of the new pantheism based on idealizing Nature as benign, which was formerly regarded as “red in tooth and claw”. For our ancestors, this would have been regarded as “climate madness”. For us it is simply a new religion that is changing America. You can tell, because now the Pope sees his best strategy is to co-opt the cult just as his ancient predecessors co-opted the cults of the Greeks and Romans.